When looking at your typical track day crashes, a large majority of them will be a result of a loss of traction from the rear tyre, usually around the exit of a turn. You don’t often see track day riders losing the front, simply because they won’t be pushing the front hard enough for it to break traction. You may see the front being lost on occasion (often mid turn), but this is usually a result of chopping the throttle or applying the brakes while carrying high lean angle. Even so, at track day level it is usually a loss in traction at the rear that sends riders on a trip to the gravel trap. Unfortunately though, riders are too quick to dismiss the issue as being down to a worn out tyre or simply being too greedy with the throttle, but there is a very common issue you see among losses in rear end traction, and one that is not very well-known. I call it, throttle and Lean. What is it? And why is it bad? Put simply, it is the act of applying throttle (accelerating) and steering the bike (adding lean angle) at the same time in the middle of the corner while at high lean angles. As you’ll no doubt know, your tyres have a sort of traction allowance, and provided your actions on the bike use up no more than that maximum allowance, you’ll happily circulate round and round the track all day long with a cheesy smile on your face. An example of going over that allowance would be a bike at high lean slamming on the front brake mid corner. High lean already uses up a lot of your traction allowance, and by grabbing the brake you would be asking much more of the front tyre than it can handle, resulting in a loss in traction and a trip back to the paddock in the wagon of shame. Just like too much brake at high lean can exceed your traction allowance, so can adding throttle (even if slight) and lean angle at the same time mid corner, which is typically displayed when riders try to tighten a line mid corner while continuing to roll the throttle on. What happens when we throttle and lean? Ok, so we know that a bike at high lean (not necessarily maximum lean) is using up a lot of the tyre’s traction allowance, but what else happens to cause the rear tyre to let go? First, a little explanation is needed. Just as changing the sprocket size on your bike will change the gearing, changing the size of the rear wheel will do the same. If you were to throw a ten inch wheel on the back, the bike would then be able to accelerate faster. Now, consider the shape of a modern day motorcycle tyre. The diameter of the centre of the tyre is considerably larger than that of the edge of the tyre, right? So what do you think happens when the bike leans over right to the edge of the tyre? It changes the gearing! In this case it actually shortens the gearing, which in turn means the rear wheel will spin up faster when applying throttle compared to when the bike is stood up. Watching the top riders in MotoGP is a prime example of this. Watch them in turns where they flick the bike over very quickly (turn 3 at Jerez is a good example) and notice how the revs go up. This isn’t the riders accelerating as they lean it over, the revs go up because the gearing has been shortened by the bike going over onto the edge of the tyre. Why the loss in traction? High lean angles take up a lot of your traction allowance, rolling on the throttle as part of your mid corner and exit routine takes up even more still, then when you lean the bike over more (to change your line) it raises the gearing and effectively means you are now accelerating even harder than you were before, even if you continue the same rate of throttle roll on. Another factor comes from the fact that you are asking the bike to do two different things. Once you get back to the throttle to start your mid corner maintenance throttle, the bike will then want to hold the line it’s currently on. Or, if you roll on enough you may even start to run a little wider. So, with the throttle you are getting the bike to hold the line or perhaps run a little wide. To then press on the inside bar and try to tighten the line goes right against what you’re asking the bike to do with the throttle. This conflict, together with the gearing effect detailed above adds up enough to surpass the traction allowance and cause the rear tyre to break away. You see it a lot at corner exits where riders have gone wide. They realise they’re running wide so they lean the bike more to get it back onto a good line, but they still maintain their original throttle plan and start rolling on at the exit as normal. The result? Added lean + normal exit throttle = loss in traction. I know first-hand of the consequences of this, as it was how I crashed out of my very first track day. 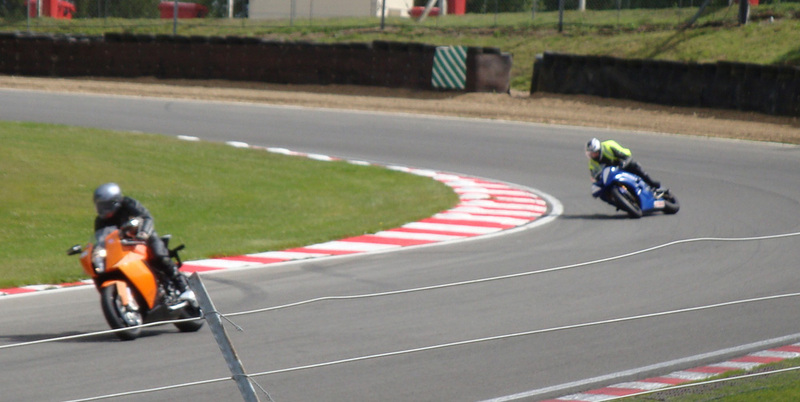 In a bid to chase the knee down grail, on the exit of Druids at Brands Hatch I could see I had a lot of track space to play with, so I tried to lean the bike more while continuing my exit throttle. The picture at the top of the page shows the result. It’s me….a split second before I hit the deck. While not a corner exit, the first twenty seconds of the video below demonstrates perfectly the results of throttle and lean. The rider turns into the left hander, starts to apply their mid turn roll on, but then incorrectly continues to add more and more lean while continuing their throttle roll on. The result speaks for itself. Never add throttle and lean at the same time mid corner! For a lot of newcomers, it is only once the bike is fully stood up that they apply full throttle. However, at slight lean angles you can actually apply full throttle without issues. This is because there aren’t enough cornering forces acting against the tyres for full throttle to cause a break in traction. So, you can in fact apply throttle (even full throttle) while adding slight lean. Watch the MotoGP guys go through turns six and seven at Assen for a prime example. This is definitely one of the more common track day crashes, and I hope the above has opened your eyes to it because this, something so simple, can be the difference between going home with your bike intact or in pieces. Just remember, at anything over moderate lean angles it’s best that you do not add throttle while adding lean angle. If you feel it is a must for a particular corner then there is more likely an issue with how you are performing the initial stages of a corner. In any case, pausing your throttle input while adding lean angle is the best course of action in this instance.